The fifth season of the American television drama series The Americans, comprising 13 episodes, aired on FX from March 7 to May 30, 2017. The show moved to Tuesdays, having aired on Wednesdays for its first four seasons. The events of the fifth season take place between February 1984 and August 1984, shown by the reference to the TV broadcasts of the 1984 Winter Olympics in episode 1 and the coverage of Ronald Reagan's "We begin bombing in five minutes" joke in episode 13. In May 2016, FX renewed the series for a 13-episode fifth season to air in 2017; and a sixth and final 10-episode season to air in 2018. The season began principal photography on October 11, 2016; and completed on March 13, 2017. Philip and Elizabeth begin a new assignment with "son" Tuan to investigate a defected Soviet agriculture expert named Morozov, his wife Evgheniya, and their son Pasha. The couple continues to disapprove of Paige's growing relationship with Matthew. Elizabeth teaches Paige a lesson in self-defense, after their daughter confesses her fears. Oleg finds himself back home in Moscow with a new task to investigate food chain corruption, which might be socially and physically dangerous. Mischa departs without permission from the USSR, alarming Claudia and Gabriel, who think he might be headed for Philip. The KGB dispatches a six-person team, including the Jennings and Hans, to retrieve a sample of weaponized lassa fever from William's infected body, which is buried in Fort Detrick. The group digs a large hole and retrieves the body, in near-complete silence. While there, Hans stumbles into the grave and slices his hand open. Knowing he is infected, Elizabeth kills him. Gabriel sends Elizabeth on an errand to Illinois, to follow Morozov and discover whether he is working on a biological warfare weapon to be used in wheat crops being traded to the USSR. In a research greenhouse, she discovers wheat-eating midges. As Paige progressively deals with her complicated existence, Elizabeth tires of the soft approach and teaches Paige a calming technique. Stan balances a new romance with a woman he met at the gym named Renee, while hearing worrisome details concerning the CIA's unfolding plans for Oleg; and he tries to set up an intervention. The Jennings consider whether Morozov is better off dead; and bond with Tuan. Paige puts her newly learned technique to the test when Matthew presses her about her emotional state. Dennis and Stan approach two potential sources, with no immediate results. Mischa's trip takes an unexpected turn in Ljubljana when his intended contact is not available. Oleg enforces anti-corruption rules in a Soviet supermarket in which Martha is seen shopping. After Oleg refuses to meet with a contact who claims to be sent by Stan, he is given a recording that would incriminate him if made public. Philip and Elizabeth decide to divulge bits of information concerning the agriculture mission to Paige, in the hope that she will become more sympathetic to their work and that being more informed will reduce her anxiety about their double lives. The Jennings are dispatched to Oklahoma City, where the midges are being bred and studied. They are forced to murder an unwitting biologist after having extracted some key intelligence from him. As a consequence of the Oklahoma City information, Philip and Elizabeth receive new "honey trapping" assignments in Topeka, Kansas, which they grudgingly undertake. Over drinks, Morozov opens up to Philip about the problems with Soviet agriculture. Oleg shares his threatening circumstances with his mother, who imparts unexpected wisdom to him about her five-year internment in a labor camp. Stan promises to publicly implicate himself in the killing of Vlad, should Oleg fall prey to the CIA's activities. After surreptitiously crossing the Yugoslav border into Austria, Mischa arrives at John F. Kennedy Airport. Meanwhile, Paige is met with an advantageous situation at Pastor Tim's home, finding and reading his journal; leading Elizabeth to both praise and berate her. Later, she suggests to Philip that they use the notes to their benefit. Philip and Elizabeth advance their honey trap missions with Deirdre and Ben, respectively, in Topeka. In Russia, Oleg continues to investigate food supply chain corruption. The CIA drops its pursuit of Oleg. Evgheniya informs Elizabeth of her interview to become a Russian language instructor inside the U.S. government. After Gabriel and Claudia discuss the risks of a meeting between Mischa and Philip, Gabriel informs Mischa that the reunion with his father will have to wait. Stan enjoys the company of Renee, although Philip suspects that she may be a KGB agent. The Jennings are happily surprised to learn that Henry is excelling in math at school, but Henry resents their amazement. Paige expresses doubt about her relationship with Matthew, and having a love life in general, to her father. Elizabeth learns that the Center has made a crucial error when Ben explains the U.S. government's program to develop a pest-resistant strain of wheat. When she relates the error to Philip, he is overwhelmed with guilt over having killed the lab employee for no reason and vows to never let it happen again. Gabriel gives Elizabeth a new assignment: get a sample of the pest-resistant wheat from Ben. Gabriel then discusses Mischa's return to the Soviet Union with Claudia and later informs the Jennings that he is returning home to Russia. He also explains that the Centre will always question Philip's loyalties. Dmitri, Oleg's target in the food chain investigation, confesses his own guilt but refuses to name his contacts despite being imprisoned. At a park, Dennis and Stan approach a Soviet woman, Sofia, who may be willing to become a source for the FBI. A random visit from a Mary Kay saleswoman triggers memories of Young Hee for Elizabeth. Oleg burns the recording of himself with Stan that the CIA gave him. As Philip's flashbacks to his youth continue, he learns from Gabriel that his father was a guard at a Siberian lumber/labor camp. Philip and Elizabeth bring Paige to meet Gabriel before he retires. Paige meets Gabriel and learns that he has been a hidden member of the Jennings family throughout her lifetime. She tells Pastor Tim that she has found a purpose and then decides to end her relationship with Matthew. Philip and Elizabeth follow Ben to Mississippi to obtain a sample of the pest-resistant wheat, which they give to Gabriel to take to the USSR, although only after finding out about Ben's other girlfriend. Elizabeth steals a file from a psychiatrist containing the names and addresses of Soviet dissidents. Dennis and Stan meet with Sofia, who works for TASS, again. Agent Wolfe tells Stan about the CIA's decision on Oleg, and Stan tells a highly edited version of the story to Renee. Oleg views the KGB files of his mother's captivity at a labor camp. During their goodbyes, Philip asks Gabriel if Renee is "one of us", but Gabriel scoffs at the idea. Gabriel then tells Philip that he was right to want to keep Paige out of spying. Oleg's bedroom is unexpectedly searched by the PGU. Evgheniya tells Elizabeth of an upcoming student "immersion" event, but when investigated, the Jennings find that she is meeting with only one, and having an extramarital affair. Elizabeth decides not to make a scheduled visit to Kansas; in a show of solidarity, Philip calls Deirdre to cancel his pending return. However, she ends their relationship. Stan and Dennis meet up with Sofia, and go over details and terms of their arrangement. Claudia fills in the handler void left by Gabriel, and Elizabeth makes an effort to endear. Elizabeth divulges to Paige that she was raped. Henry has friends over to the house, including "Chris", a girl he is romantically interested in, while Elizabeth and Philip converse with Stan. The Jennings and Tuan decide on a cruel course of action concerning Pasha at school to encourage Evgheniya's return to Moscow. Having talked with Elizabeth, Philip is able to regain Deirdre's interest by telling her he is married. Henry informs his parents of his desire to attend a prestigious New England boarding school in the fall along with some of his new friends, including Chris. Philip checks in on Kimmy and retrieves a recording from her father's office indicating that the Soviet government may be using lassa fever in Afghanistan against the U.S.-backed insurgents. Philip also meets with one of Gabriel's other agents, a Russian priest named Father Andrei. Back home in Moscow, Gabriel pays a visit to an adjusting and unwelcoming Martha. Agent Wolfe relays to Stan conclusive evidence that the KGB was behind Gaad's murder, and opines that the U.S. should once again aim to blackmail Oleg. Stan meets with Gaad's widow, who thinks that Gaad would want revenge on the Soviets. Meanwhile, Oleg is questioned about his relationship with Stan and Nina by the same PGU team that raided his room. When he returns home, he and his father have a conversation about his mother's days in a labor camp. Later, Oleg pressures prisoner Dimitri into giving up the name of one of his suppliers, Lydia. Elizabeth decides she should spend the night with Tuan, but he never comes home. She, Philip, and a team of other agents set up a tail and track his movements to Harrisburg, Pennsylvania, where he ducks inside an IHOP. When questioned at gunpoint, Tuan explains that he is checking up on a sick relative from his foster family, and begs the Jennings not to report the mishap. After Tuan's plan to make Pasha miserable at school takes effect, Morozov discusses his homesickness with Philip, and Evgheniya discusses her unhappiness with Elizabeth. After receiving a coded note from Philip, Tatiana approaches Evgheniya and tells her that there will be no repercussions against her family if they return to the USSR. In reading Pastor Tim's diary again, Paige finds his comments about her, which deeply upset her. Claudia tells the Jennings that she is unaware of any Soviet use of lassa fever and that their honey-trap missions in Topeka will have to continue long term while Soviet scientists continue to work on the hybrid wheat; the Jennings inquire about the Centre having Pastor Tim offered an attractive job elsewhere. Sofia tells Stan and Dennis about Gennadi, a former Soviet hockey star who carries confidential diplomatic packets to the U.S., and the FBI discusses how to acquire such a packet. In a Russian Orthodox ceremony secretly performed by Father Andrei, Philip and Elizabeth marry each other under their Russian names Mischa and Nadezhda. Paige takes photos of Pastor Tim's diary, and Philip and Elizabeth are shocked to read his description of their actions with Paige as "monstrous" and potentially permanently damaging. Philip tells Henry that, if he's admitted, he can go to boarding school. Claudia gives the Jennings a new assignment: targeting a woman living in suburban Boston, who might be Anna, a Nazi collaborator in Dyatkovo during WWII; they tell her that Paige is OK with luring away Pastor Tim. Claudia also reveals that the Soviets did weaponize William's lassa fever. For a school paper assignment, Henry tours FBI counterintelligence with Stan. Oleg and his partner investigate Lydia and find her ledger detailing her activities, but she is unintimidated by them despite impending imprisonment. At gunpoint, Anna admits her WWII activities to the Jennings and her American husband, although she describes the duress she was under at age 16 after the Nazis killed her parents. When Philip hesitates, Elizabeth murders Anna and her husband. Afterward, in their car, Elizabeth tells Philip, "Let's go home." Pastor Tim tells Paige that he's accepted a position with an international church group in Buenos Aires and will be leaving in two months. Oleg is again questioned by the PGU about his relationship with Stan and Tatiana, specifically relating to William's capture by the FBI, but he denies any knowledge. Oleg requests that no action be taken by the KGB against his informants in the food investigation, but he then learns that no action will be taken against the ringleaders, either. The Jennings tell Claudia that they are thinking of returning to the Soviet Union with their children. Evgheniya tells Elizabeth that her husband will not return to Moscow despite Pasha's troubles, and Elizabeth tells Tuan that they need to find a new approach. Sofia unexpectedly introduces Stan and Dennis to her boyfriend Gennadi, who knows all about her activities, and Stan and Dennis believe Sofia's cover has been blown. The Jennings ask Pastor Tim whether he thinks Paige and Henry could live in the USSR. Henry and Chris prepare dinner for his family as thanks for letting him go to boarding school, but Paige senses that something is wrong. Tuan tells the Jennings that he has persuaded Pasha to slit his wrists to get his parents to move. When the Morozovs' phone is unanswered at the appointed time, Philip leads Elizabeth and Tuan to the Morozov house, despite the presence of a surveillance car outside it. The Jennings and Tuan discover Pasha wounded but alive. As a result, Evgheniya agrees to take him back to Moscow, without her husband. In a post-mortem analysis, Tuan criticizes the Jennings for their "petty bourgeois" concerns, and Elizabeth tells Tuan that he will fail without a partner. Gennadi passes an FBI polygraph test. Renee moves in with Stan due to flooding in her apartment and then talks him out of leaving counterintelligence. In Moscow, Martha's language instructor, after consultation with Gabriel, tells her that she will be allowed to adopt a young orphan named Olya. Philip and Elizabeth make their final decision to return home to the USSR with their children, who have not been told. Henry and Chris are admitted to the boarding school, but Philip tells Henry, without explanation, that he cannot go. Paige continues training with Elizabeth. Philip tells Kimmy that he may take a job overseas but he later learns that Kimmy's father Isaac is being promoted to head of the CIA's Soviet division. Both Philip and Elizabeth agree that they will have to stay in the U.S. to continue the Kimmy operation, but Elizabeth volunteers to handle new assignments by herself. The fifth season has received widespread critical acclaim. On Rotten Tomatoes, it received a 95% approval rating with an average score of 9.09 out of 10 based on 37 reviews, with a critics consensus of: "In its penultimate season, The Americans brings long-simmering storylines to a boil while heightening the spy-thriller stakes and deepening the domestic drama—all brought vividly to life by superb performances from its veteran cast." On Metacritic, the season has a score of 94 out of 100 based on 19 reviews, indicating "universal acclaim". Matthew Gilbert of The Boston Globe gave it a highly positive review and wrote, "The drama remains as tense as ever, with strong, careful writing and an abundance of fine performances". Tim Goodman of The Hollywood Reporter also lauded the series, "It's extremely well-constructed, with slow-burning storylines that are paying off in superb dramatic depth" and praised its "top-tier acting" and "artfully crafted visuals". In regards to the premiere, some criticisms came from Todd VanDerWerff of Vox who noted that the symbolism of "spending a long time digging a hole so deep that you probably can't escape it—while knowing you'll lose friends along the way—is a little on-the-nose", while Mike Hale of The New York Times was not very excited with the first episode's "grainy montage set to martial music that began with images of collectivist agricultural might before seguing to blighted fields and long lines outside stores." Libby Nelson of Vox thought that "the agriculture plot was the weakest link" in the second episode. The fifth season was criticized for becoming too slow, turning the show from "slow burn" into just "warm embers". According to Fields and Weisberg, they wanted the fifth season "to feel different as it unspooled", harvesting the story pieces created in the fourth season. The fifth season was not meant as a set-up for the sixth season. With pacing of the fifth season slowed down intentionally, Weisberg and Fields admitted that they did not expect "this much of a backlash" for "hitting the brakes too hard". They were upset by criticism, but suggested waiting until the series is over, hoping for the response to become more muted in context of the sixth and final season. For the 33rd TCA Awards, The Americans received a nomination for Outstanding Achievement in Drama. For the 69th Primetime Emmy Awards, the series received four nominations–Matthew Rhys for Outstanding Lead Actor in a Drama Series, Keri Russell for Outstanding Lead Actress in a Drama Series, Alison Wright for Outstanding Guest Actress in a Drama Series, and Joel Fields and Joe Weisberg for Outstanding Writing for a Drama Series for "The Soviet Division". ^ a b Andreeva, Nellie (May 25, 2016). "'The Americans' To End Run With Two-Season Final Renewal By FX, EPs Ink Deals". Deadline Hollywood. Retrieved May 25, 2016. ^ Abrams, Natalie (January 12, 2017). "FX sets 'Feud', 'The Americans' premiere dates". Entertainment Weekly. Retrieved January 12, 2017. ^ Patten, Dominic (May 30, 2017). "'The Americans' EPs On Tonight's Finale, The Series' "Resolution" & Why No Trump". Deadline Hollywood. Retrieved June 2, 2017. ^ Ausiello, Michael (October 19, 2016). "'The Americans Season 5: Laurie Holden Cast as Love Interest for [Spoiler]". TVLine. Retrieved January 28, 2017. ^ Kourlas, Gia (April 26, 2017). "I Don't Miss 'Swan Lake': A Ballerina's Role on 'The Americans'". The New York Times. Retrieved April 27, 2017. ^ D'Alessandro, Anthony (August 9, 2016). "'The Americans' EPs Drop Heavy Hints About Season 5: TCA". Deadline Hollywood. Retrieved August 9, 2016. ^ Fields, Joel [@joel_fields] (October 11, 2017). "And… Action! First shot, 7:52am. :-) #TheAmericans" (Tweet). Retrieved January 28, 2017 – via Twitter. ^ Fields, Joel [@joel_fields] (March 13, 2017). "Season 5, Episode 13 in the (digital) can! :-) #TheAmericans" (Tweet). Retrieved March 14, 2017 – via Twitter. ^ Metcalf, Mitch (March 8, 2017). "Updated: ShowBuzzDaily's Top 150 Tuesday Cable Originals & Network Finals: 3.7.2017". Showbuzz Daily. Retrieved March 8, 2017. ^ Metcalf, Mitch (March 16, 2017). "Updated: ShowBuzzDaily's Top 150 Tuesday Cable Originals & Network Finals: 3.14.2017". Showbuzz Daily. Retrieved March 17, 2017. ^ Metcalf, Mitch (March 22, 2017). "Updated: ShowBuzzDaily's Top 150 Tuesday Cable Originals & Network Finals: 3.21.2017". Showbuzz Daily. Retrieved March 22, 2017. ^ Welch, Alex (March 29, 2017). "Tuesday cable ratings: 'WWE Smackdown' and 'The Challenge: Invasion' hold steady". TV by the Numbers. Retrieved March 29, 2017. ^ Metcalf, Mitch (April 5, 2017). "Updated: ShowBuzzDaily's Top 150 Tuesday Cable Originals & Network Finals: 4.4.2017". Showbuzz Daily. Retrieved April 5, 2017. ^ Metcalf, Mitch (April 12, 2017). "Updated: ShowBuzzDaily's Top 150 Tuesday Cable Originals & Network Finals: 4.11.2017". Showbuzz Daily. Retrieved April 12, 2017. ^ Metcalf, Mitch (April 19, 2017). "Updated: ShowBuzzDaily's Top 150 Tuesday Cable Originals & Network Finals: 4.18.2017". Showbuzz Daily. Retrieved April 19, 2017. ^ Metcalf, Mitch (June 1, 2017). "Updated: ShowBuzzDaily's Top 150 Tuesday Cable Originals & Network Finals: 5.30.2017". Showbuzz Daily. Retrieved June 1, 2017. ^ "The Americans: Season 5 (2017)". Rotten Tomatoes. Retrieved June 1, 2017. ^ "The Americans : Season 5". Metacritic. Retrieved March 9, 2017. ^ Gilbert, Matthew (March 3, 2017). "Bygone era of 'The Americans' feels closer than ever". The Boston Globe. Retrieved March 9, 2017. ^ Goodman, Tim (March 6, 2017). "'The Americans' Season 5: TV Review". The Hollywood Reporter. Retrieved March 9, 2017. ^ "The Americans season 5 premiere: "Amber Waves" digs a hole some characters won't escape". Vox. March 8, 2017. Retrieved March 8, 2017. ^ Hale, Mike (March 7, 2017). "'The Americans' Season 5, Episode 1: New Wigs, New Family". The New York Times. Retrieved March 8, 2017. ^ "The Americans season 5, episode 2: "Pests" forces everyone to reconsider what it means to do "the right thing"". Vox. March 8, 2017. Retrieved March 15, 2017. ^ Nemetz, Dave (May 30, 2017). "'The Americans Bosses on the Finale's Tragic Twist, Season 5's Slow Burn and the Show's Ultimate Endgame". TVLine. Retrieved August 1, 2017. ^ a b Hibberd, James (May 30, 2017). "'The Americans producers on finale, and if season 5 was too slow". Entertainment Weekly. Retrieved August 1, 2017. 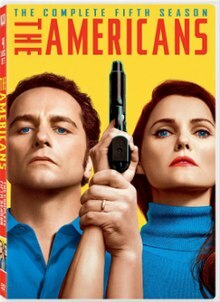 ^ "The Americans". Emmys.com. Retrieved July 13, 2017. This page was last edited on 17 February 2019, at 20:09 (UTC).